regarding Madonna’s 1989 album, Like a Prayer, turning thirty. I looked, extensively, at the album before and covered the period from 1986 and 1992: when she released True Blue (1986) and followed up Like a Prayer with Erotica (1992). I will not write at such length now but, when reading back on what I had written for that piece, I was struck by the fact that, in many ways, Like a Prayer represented a new height for Pop music: in some ways, the mainstream has softened and would do well to rediscover this album. There were more progressive and daring albums released in 1989 – this was during the golden era of Hip-Hop, let’s not forget! – but look at 2019 and is Pop really as bold and inspiring as it could be? I could say the same about all of music, in fact. I cannot claim to be a Madonna mega-fan – I am probably not part of her key demographic – but I love her aura and the fact that she seems like a relic of a past time. Not in any insulting way, you see: she is almost film star-like in her gravitas and life. Around the time of Like a Prayer, Madonna’s marriage to Sean Penn was in a state of crisis and she was channelling familial issues and domestic stories into her work. Here was someone who was taking inspiration from around her, good and bad, and making this very challenging and open album. There are those who claims that Like a Prayer has filler in it – one cannot argue Love Song is an essential cut – and records like Ray of Light (1998) and True Blue (1986) are most consistent. There is snobbishness regarding Like a Prayer and the attention it gained. Maybe those who slur it are looking for the same old Madonna: peppy Pop hits that get you dancing. That is the beauty and strength of Like a Prayer. There are fresh and youthful songs like Express Yourself but, as one of the world’s biggest artists, she was not afraid to tackle subjects that were more meaningful. It is because of albums like Madonna’s 1989 gem that artists today are bolder with their material. It is not common to hear about domestic issues and bigger themes like AIDS in modern music but look at how Pop changed from 1989 and the artists that came through. Whether it was greater expression regarding sexuality and personal matters; making albums less commercial and more thought-provoking...a lot of this quality can be traced back to Madonna. Madonna, also, is a star then and now who does not run her words by a publicist or manager. Not to say she was reckless but, if she was as cautious as some artists today, would she have put together material that was much more progressive and challenging than her peers’ work?! I do think there is far too much caution today and, in this social media age, are the best of the mainstream taking risks and standing out? Look at the images for Like a Prayer, the title song’s video and how Madonna created this piece of art. Musicians today are pushing the album concept and joining together art and music – again, many can trace that debt back to Madonna. Even though Like a Prayer is three-decades-old, I feel like it is still inspiring the Pop scene. In a way, mind, it remains a rare and unique thing. I have talked about artists who take to stage and screen but, aside from Lady Gaga – who has often been compared to Madonna – there are not many multi-disciplinary artists who one can see gracing the screen and cranking out top albums. No names spring to mind and, in an age where everything is so calculated and controlled, does the bigger artists have the same work ethic? Even though there was a three-year between True Blue and Like a Prayer, Madonna was in films, on the stage and hardly resting! That concept of this all-conquering Popstar, I feel, stopped with Madonna. There have been some mighty artists since 1989 but I feel like we do not have icons anymore. 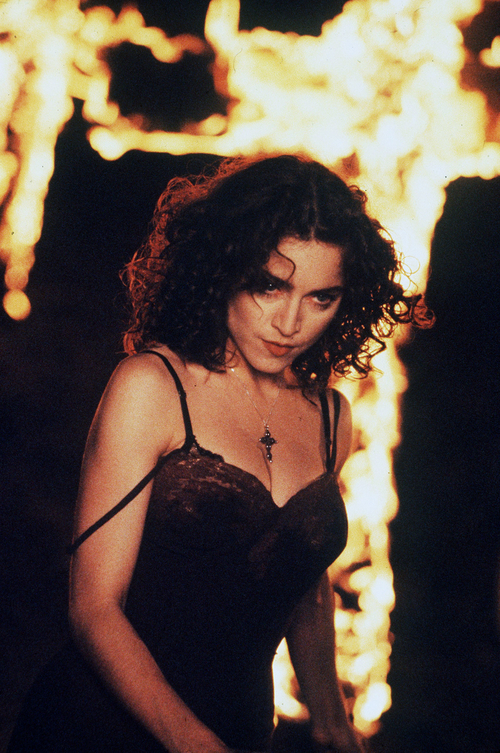 Like a Prayer was part of this narrative: the birth and rise of a star that was conquering music and turning heads wherever she went. Whether you are a fan of the album or not, the sheer excitement and publicity that was out at the time was incredible. I know Madonna, like artists today, has a team behind her and she was not truly solo but, in the way she acted and how she portrayed herself, this was someone trying to stand out and inspire. I mentioned how Madonna helped bring certain subjects into the mainstream and, in 2019; I wonder whether we have stepped back. Although she has inspired countless artists with Like a Prayer, I feel like an anti-Madonna campaign that greeted her in 1989 (the likes of Rolling Stone are responsible) remains still. I hope people listen to the album on its thirtieth tomorrow and discover a very rich and rewarding album. There is a depth and sense of conviction throughout that is missing from so many albums today. Madonna was considered a poor singer by some because she lacked belt and that raw power. As we still celebrate talent show clones and waste our time supporting them, those who appreciate singers with greater subtlety and colour know where Madonna’s strengths lie. Madonna would make bolder albums than Like a Prayer (such as Erotica) and better-reviewed ones (like Ray of Light) but, on 21st March, 1989, she added this bomb to the Pop scene. In a year that was more synonymous with other genres and breakthroughs, Like a Prayer was this event and extravaganza that confirmed Madonna’s place as the Queen of Pop. Think about the controversial Pepsi ad – she was pulled after the Like a Prayer video received flack – and the fact Madonna was this spokesperson. The documentary, Madonna: Truth or Dare, was not far away and she would soon embark on her Blond Ambition tour – this huge, worldwide sensation that, once more, showed she could never slow down! So many of the artists we see today straddling huge tours, various mediums and what not must consider Madonna a role model. She was so different to anything in music in the 1980s and her impact was clear. I do love the fact that she inspires artists and has been responsible for changing music (in her own way). I do wonder whether, in a rather bittersweet way, Like a Prayer is a happier memory from a different time. Certainly, apart from a few artists in the mainstream, there are few that write genuinely optimistic Pop songs – how many can write songs that have no negativity or anxious undertone?! I do miss the idea of a genuine icon that has these evolutions between albums (and reinvents themselves). It is hard to detect icons and unique artists today. We could clearly see Madonna changing before 1989 and, after the success of Like a Prayer, she would take even bigger steps and become even more extrovert and boundary-pushing.